Is your current fraud prevention system blocking genuine customers? Does your analysts’ review queue never seem to end, yet you’re still suffering chargebacks? Do you want to increase conversion? On the very day that you’re reading this, we’ve already checked over a million transactions from merchants that were experiencing these same problems… Welcome to the community – welcome to Perseuss. 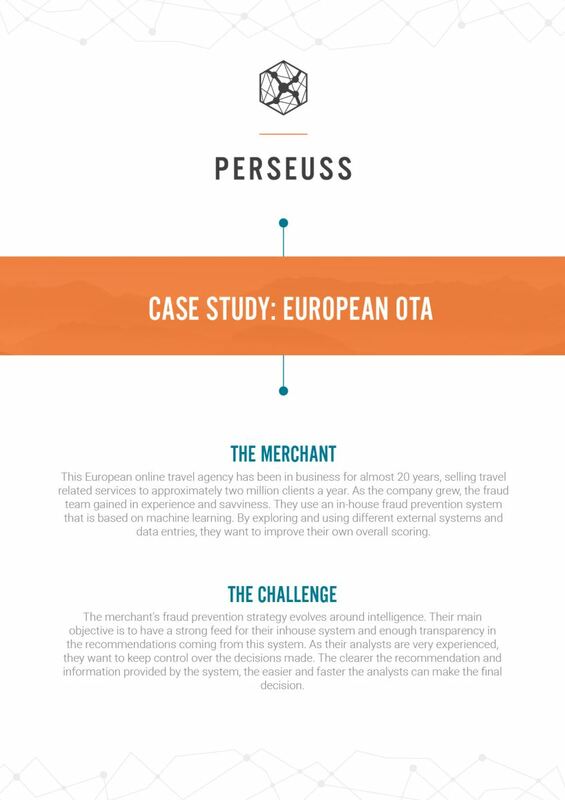 Perseuss’ advanced, AI-based fraud detection is amongst the best of the world. It presents you with immense amounts of fraud intelligence in a smart, quick and comprehensible way. Using it will increase your conversion and decrease the number of chargebacks. You’ll take decisions faster, more accurate and have less of a review queue. We know your customer and we’ll help you decrease the risk of rejecting a good transaction. Overall: you’ll have better bottom line results. Back in the day, when data sharing wasn’t as common as it is today, Perseuss was founded by a community of merchants suffering fraud issues. For more than ten years, merchants across verticals and from around the world have been sharing their transaction and fraud data via Perseuss. By now, the size of the database is unparalleled in conversion optimization and fraud prevention. We have evolved from a simple fraud database into a sophisticated DATA intelligence platform applying advanced artificial intelligence. Perseuss is created and governed by merchants themselves. Other than most fraud solutions, it is agnostic: to region, to PSP, to sectors and industries. This way we’re able to recognize fraud patterns that no merchant or fraud tool would’ve been able to identify individually. The most well-known and relevant payment and fraud service providers recognized the uniqueness and added value of Perseuss and created a one-click integration in their platforms. We recommend you to use Perseuss in combination with another fraud prevention system that fits your fraud strategy, architecture and operations. Perseuss will complement your tool with AI-based knowledge of world-wide fraud patterns and enable in-depth manual research. You’ll also receive the support of our highly active community in fighting the global and increasing threat of ever-changing fraud. Transactions can be checked in several ways: manually, uploading batch files, or via API. API integrations can be done directly or through a Payment Service Provider. As we’re already integrated with most PSP’s, the activation of your account will be a simple push of a button. Click here for more information. Manual Research The decision to block or accept a transaction is always up to the merchant. By logging on to the online environment, fraud analysts can use a variety of tools to dig into the specifics of a case and gather intelligence. Artificial Intelligence Our artificial intelligence uses transactional data, confirmed fraud data, and time-based data to constantly improve its performance. This results in precise fraud detection, increased conversion and less manual review. Contact the owner Contact the merchant that uploaded the case as fraud in the system. In a frequently used chat, merchants help each other to take the best decision. Legal action Perseuss is highly involved with many law enforcement agencies (LEA). Part of the service is coordinating the cooperation between merchants and LEA's, to take the next step in catching the fraudsters and ghost brokers. Asian airline Speed is key for this Asian airline. Therefore they needed some help reducing their manual review queues and enriching their data to make quicker decisions. Find out how Perseuss was able to help them. European OTA This experienced European OTA is looking for intelligence. More information they can rely on, trust and receive in their own interface. Perseuss won them over. See here how we did that. "Unfortunately there are still some airlines that don’t realise just how much fraud is costing them, beyond what they see as chargebacks. Perseuss is an important tool in the BA fraud prevention toolbox, not just from the data perspective but from the intelligence and support the Perseuss community provides. 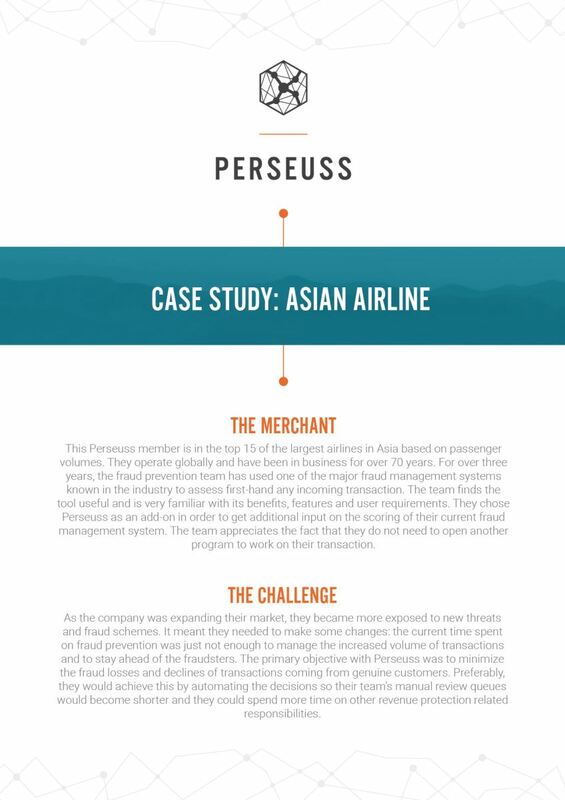 Without Perseuss to help your airline fight fraud, you are missing a vital piece of the decision making jigsaw." "Travelplanet24 is an OTA which operates in 16 countries and turns over €220 million. As we grew our business across Eastern Europe from 2010 onwards, card fraud hit us badly, driving up losses to unsustainable levels. To counteract this fraud we integrated several external systems of which Perseuss is among the most important. Perseuss has helped us reduce our fraud rate from 0.6% of turnover to 0.07% whilst cutting our manual review rate from 25% to 9% and our order rejection rate from 3% to 1%. Perseuss is a vital part of our fraud defences and we wouldn’t be without it"